A deadly car bomb has exploded in a crowded market in the southern Iraqi town of Bathaa, killing at least 28 people, say officials. Dozens of people were reported to have been injured in the mid-morning attack. The area has been the scene of fierce fighting in the past between rival Shia militia factions. The attack comes weeks before US forces are due to withdraw from towns and cities in Iraq, leading to concerns that violence could escalate. Police say the bomb was in a parked car in the town of Bathaa in Dhiqa province, about 320km (200 miles) south-east of Baghdad. "There was a big explosion, it was an awful incident" said Farhan Fadel, 31, who suffered a broken leg and injured abdomen in the blast. Hassan Ali, a 44-year-old grocer, said some of his friends were killed or injured. "There was smoke everywhere," the AFP news agency quoted him as saying. There were conflicting reports about casualty figures, with official sources withdrawing their initial statement that 30 people had been killed. Bathas's mayor, Ali Fahad, said the casualties were being taken to a hospital in Nasiriya, about 30km away. "Children and women are among the dead," he said. Overall, attacks have fallen sharply in Iraq. But a number of recent blasts in the south have raised fears that sustained violence could return to the area. 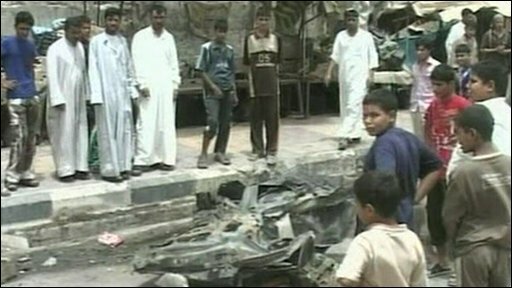 The BBC's Nicholas Witchell, in Baghdad, says that because Bathaa is in a Shia area, Sunni insurgent groups linked to al-Qaeda will inevitably be suspected of being behind the blast. The US plans to withdraw its troops from Iraqi cities and major towns by 30 June, and is due to end combat operations across Iraq by September 2010, leaving Iraqi security forces to cope alone. There are concerns that insurgents may try to take advantage of the withdrawal, although the country's leaders say Iraqi forces are capable of handling internal security without US support, says our correspondent.